Somehow I missed this notice when it came out in May. I grew up in one of those households that had stacks of hardcover issues of American Heritage all over the place, on bookshelves here and there, in the basement, the garage, on the top shelf of the hall closet. I don't remember how old I was before I took an interest in them, but eventually I began to flip through the issues at random. Later, on trips home from college, I flipped through them again, this time looking for articles of interest on certain subjects. At some point I purchased the big, hardcover index, but it was of little use in the chaotic shuffling of serial publications in a home overrun by reading material. But the randomness, of course, was part of the appeal -- just grab a couple issues on your way to the bed, and there was bound to be one article, one essay, one "brush with history" that would be worth staying up for. I tried to salvage a lot of those old casebound volumes, but they were just so damn heavy, and not conducive to apartment living and multiple moves. Invariably, they would end up in some dank, moist place, and have to be tossed in the dumpster on the next move. I subscribed, on and off, to the modern glossy magazine, but that tailed off. Sometimes, I picked it up off the newstand. Editorially, it had its ups and downs, but I don't mind saying it was always among my favorite magazines. As I typed this blog entry, it occurred to me why AH is suspending print publication. Even loyal readers who were weaned on it have stopped buying it. That's a little sad, but "so it goes," if I may quote another American icon we lost this year. AH, at least, will continue online with a top-flight website [image at top: cover, October 1959, vol. 10, no. 6]. American Heritage, the nation’s preeminent magazine of history . . . has stopped publication, at least temporarily, with the April/May 2007 issue, now on newsstands. The website will continue to publish. American Heritage, a bimonthly, was founded in 1954. It was bought by Forbes Inc. in 1986 and has suffered financially in recent years amid hard times for magazines in general. Forbes put it up for sale earlier this year and has not yet found a buyer. 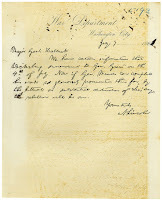 We have confirmation that Halleck could accurately transcribe a note. . . The National Archives held a press conference today to announce they'd located an original, handwritten note from Abraham Lincoln to Henry Halleck. . . a note that Henry Halleck reproduced verbatim in a telegram to General Meade (a telegram that was published in the Official Records, vol. 27, pt. 1, p. 83). It's nice to know the original has been found. But a press conference? I haven't been this let down since Geraldo opened up Capone's vault. Some fellow bloggers weighed in recently on the distinctions between amateur and professional historians in the world of Civil War historiography (for example here, and here, and here). I could venture a few opinions on that myself, but probably not without insulting someone I know on both sides of that definition. As a personal aside, I do not claim the mantle of “historian” for myself, because I don’t fit the bill. I don’t have the advanced training, and I don’t spend a lot of time doing original research. I read a lot, and I distill and I synthesize, and sometimes that leads to observations that seem more fresh than stale, at least to people who have read less. Rather than professional versus amateur, it might be more useful to distinguish between good, and lousy. The good ones contribute something lasting. James Hall, who died in February of this year at age 95, was something more than an amateur historian (see his Washington Post obit here). 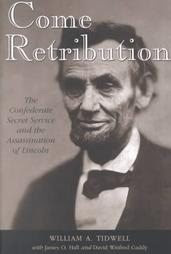 He was an amateur historian who was also recognized as a leading authority on his chosen subject -- in this case, the assassination of Abraham Lincoln. A recent Wall Street Journal essay quotes an unnamed associate as saying that “James O. Hall knew more about Lincoln's murder than anyone who ever lived, including John Wilkes Booth.” That may be stretching things a bit, but probably not by much. In the same vein, we could make the point that Licensed Battlefield Guides at Gettysburg, perhaps even faithful readers of the Gettysburg Discussion Group, know more about what transpired in that three-day battle than did Robert E. Lee on his deathbed. But Hall did more than become well versed. He helped to definitively debunk a widely accepted text, Otto Eisenschiml’s, Why Was Lincoln Murdered? And as a researcher, he uncovered a document that must have made dedicated Lincoln scholars tremble and weep: John Wilkes Booth’s handwritten rationalization for the murder he would commit later that day. Score one for the amateurs. Mr. Hall apparently had the added quality of not being pompous, an affliction that may be more common among the over-educated, but which has been known to spill over into amateur ranks as well. He could have gone for a high-profile glossy magazine exclusive to celebrate his find, but no. And he could have donated his private archives to a university in exchange for a plaque announcing the James Hall Reading Room, but no. This excerpt from a WSJ essay sums it up. Typically, in 1977, Mr. Hall chose to publish this astonishing find in the Lincoln Log, a newsletter for buffs. Its circulation was minuscule compared with the slick magazines--National Geographic or American Heritage--that would have loved to showcase such a find and maybe make its discoverer famous. But Mr. Hall was without professional vanity; that's what it means to be an amateur, after all. At the end of his life, Mr. Hall treated his vast archives with the same modesty and discretion. At least two well-endowed universities made a play for the contents of his file cabinets. Instead, he gave them to the small, homespun Surratt House museum, once the country home of the Lincoln conspirator Mary Surratt and a favorite gathering place for buffs. With a single stroke, he transformed the museum into the Alexandrian library of assassination studies. It was a gesture of confidence and fellow feeling, made to all amateur historians from the best of their kind. What: A press conference to announce and unveil a newly-discovered Lincoln document. Archivist Allen Weinstein has hailed this discovery as a “significant find.” The press will have the opportunity to film/photograph the discovery after the remarks and unveiling. Where: The Archivist’s Reception Room, National Archives Building, Washington, DC.Media should use the 700 Pennsylvania Avenue entrance. Please Note: No Artificial Light may be used on the document. Getting off to a good start. . . I know people who managed to get all the way through college without reading a play by Shakespeare, or attending a course in American history. And as near as I can tell, for every literature and history course that I took, and that they avoided, their future net worth doubled. Not that I’m bitter – we history and literature majors will always find gainful employment as “good communicators” (some of the best memo writers in the workforce today). Now obviously, many very bright people have little interest in literature or history. They may be dull as bars of soap, but it’s no crime. There’s good news for some of their bright children, however. It is pleasing to see that UC Berkeley’s College of Letters and Science is making incoming freshmen read a book on the roots and legacy of a Civil War era speech before they even arrive for classes. Over the summer, all newly-admitted L&S students will receive a copy of Lincoln at Gettysburg in the mail, along with a message from the deans asking them to read the book and come prepared to discuss it. When they arrive during Welcome Week they will find opportunities to talk about the book with professors and fellow students in a variety of contexts, ranging from one-time discussions through semester-long Freshman Seminars. On the Same Page activities will culminate in a three-day campus visit by Garry Wills, who will talk with groups of students and faculty and give a public presentation on September 26 in Zellerbach Hall. What a neat program – a book club in which every participant is nearly guaranteed to read and comment on the selected text. Will it cause some new student to rethink his or her preprogrammed career studies? Will there be one less chemist or petroleum engineer? Nah, but there will be some better educated ones.